Blue Raspberry, this adorable Li'l Sweet & Sassy stuffed dolphin, is a great companion for all kinds of imaginative adventure. With soft blue fur, white tummy, and pink accents with shiny silver flecks, this sweet plush dolphin has the most beautiful sparkly blue eyes! Look into their depths and you're sure to feel warm fuzzies. Another great thing is that when you purchase this lovable Li'l Sweet & Sassy plush dolphin, a portion of the proceeds helps to provide housing and education for disadvantaged children, as well as protection for abandoned animals throughout the world. Fun Facts about Dolphins: Did you know that Bottlenose dolphins are carnivores which normally feast on fish, shrimp, and squid? This adorable blue dolphin plush keychain has soft blue fur, light blue accents, and sweet embroidered eyes. 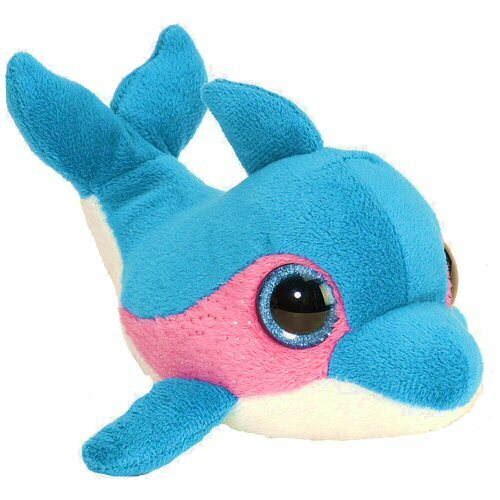 Splash, this adorable Dreamy Eyes stuffed dolphin has soft gray fur, white tummy, fun fins, and big, sleepy pink eyes. Dolly, this Dreamy Eyes stuffed dolphin, has soft gray fur, white tummy, fashionable fins, and big sleepy blue eyes in an oh-so-sweet face. This fun pink dolphin plush keychain has soft pink fur, light pink accents, and sweet embroidered eyes.